Designers these days are shaking things up, and mixing woods and different materials throughout the home. 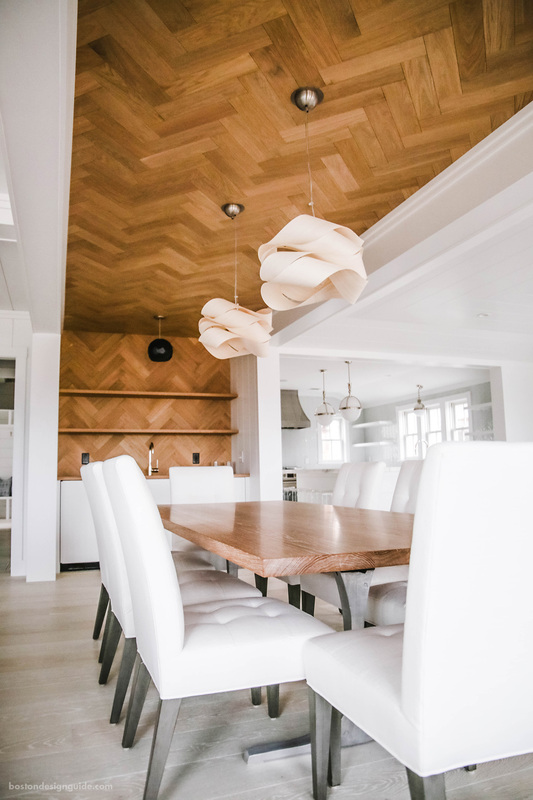 Just ask Mac Davis, owner and CEO of Mac Davis Flooring, whose hardwoods are often found on ceilings and on accent walls for a stunning and gravity-defying effect. “It used to be that if the homeowner picked a solid white oak, it was going to be used everywhere and in the same color,” says the National Wood Flooring Association specialist. No longer. 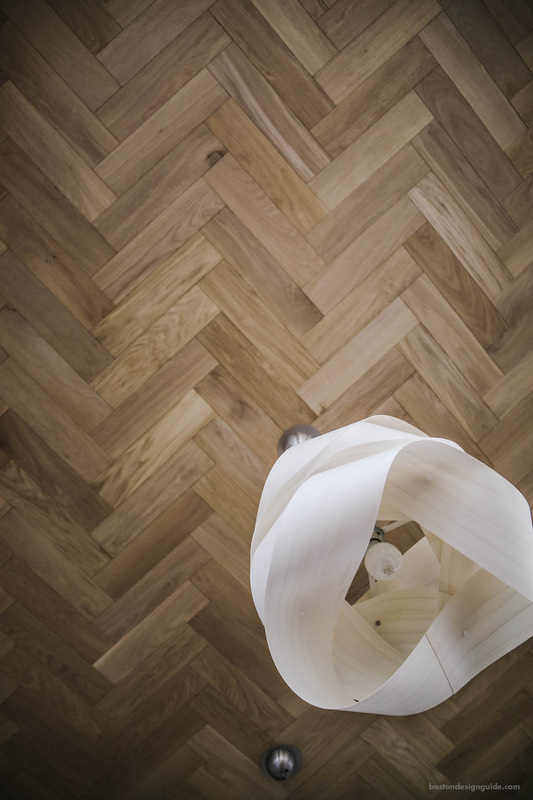 Wood has become a design element, at times used in lieu of tile, and not just underfoot. 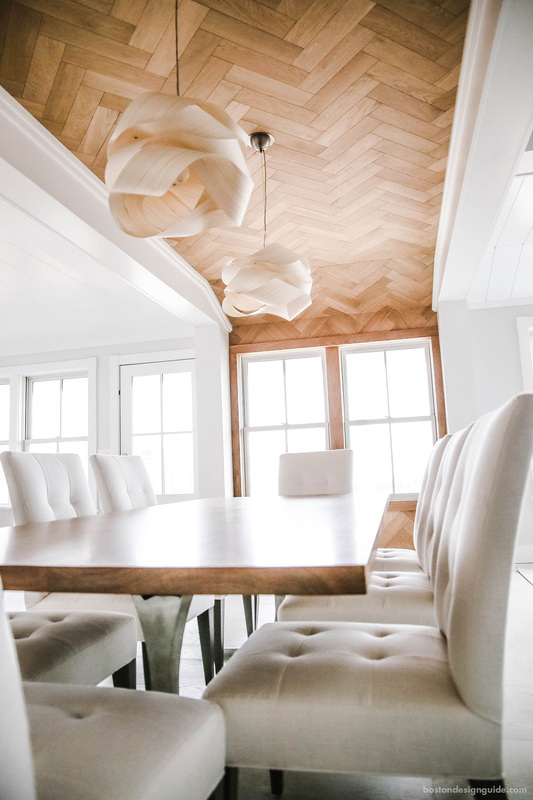 This project in Nantucket features a center channel of European oak in a herringbone pattern against a sea of crisp white, which includes European select flooring in a Skift pre-finish. Both are engineered European oak (a veneer application that lends itself to “dimensional stability,” says Davis, meaning that the wood won’t expand and contract like an all-wood floor would when the moisture in the room changes with the seasons) and the juxtaposition is striking. “The two together show the versatility of the product,” shares Davis. And the beauty. “European oak is a live sawn wood, which means it has four different cuts,” says Davis, and plenty of character. It also helps to define a given area of the home, a necessity in today’s open-concept layouts. Here, the herringbone oak highlights the dining area, creating a gather-’round effect that extends from the ceiling to encompass the bar backsplash on one end and the window frames on the other. As one might think, the installation is challenging, requiring staging and a deft hand to place the wood piece by piece overhead. The process takes about four times what is typical for flooring, but the design is worth it. For patterns like herringbone and chevron (another Davis favorite! ), you have to know how to set up the home and lay it correctly so that the pieces of wood fall symmetrically within the space. Mac Davis Flooring is located in Nantucket and now has a second location in Osterville.